Just four days after president Trump signed an executive order last Thursday enabling new sanctions on Venezuela’s gold sector, in a bid to disrupt trade with Turkey which U.S. officials believe is undermining efforts to cripple Venezuela's economy and force Maduro and members of his government out of office, Maduro is now seeking to repatriate about $550 million in gold bars from the Bank of England over fears it could be caught up in international sanctions on the country. 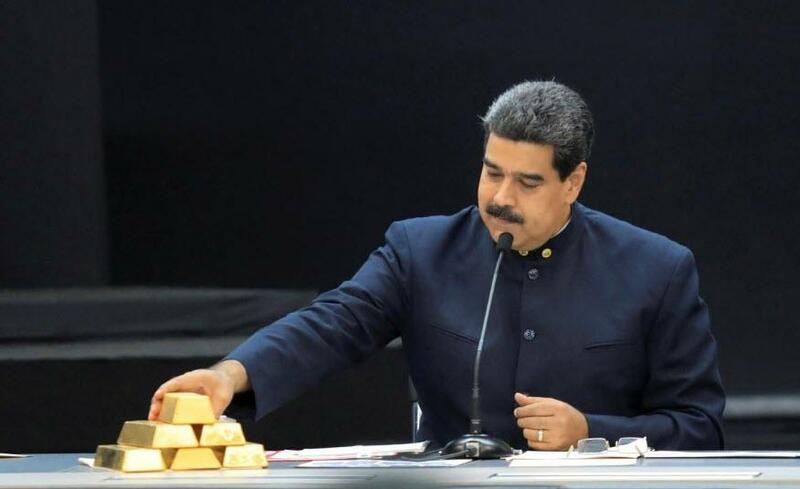 There are two problems: i) Maduro is probably too late now that the US has effectively placed a lien on Venezuela's gold, and ii) there is barely any precious metal left. Venezuela’s hard currency holdings have dwindled as existing U.S. financial sanctions have effectively blocked President Nicolas Maduro’s government from borrowing on international markets. According to the IMF, venezuela's gold reserves were just above 5MM troy oz most recently, down from a recent peak just below 12 million. Much of this decline is due to the country's payment for imports in gold, and is what the US is hoping to curb going forward. As a result, Maduro’s government is now - belatedly - hoping to redo what his predecessor Hugo Chavez did several years ago when he prudently repatriated the bulk of Venezuela's gold, and now Maduro is seeking to repatriate the 14 tonnes of gold held in the Bank of England back to Venezuela. Confirming that this transaction won't be exactly "smooth", Reuters reports that the Bank of England has "sought to clarify what Venezuela wants to do with the gold", suggesting that despite Venezuela being the rightful owner of this gold, it is about to face challenges in getting it back. According to Reuters, the plan has been held up for nearly two months due to difficulty in obtaining insurance for the shipment, needed to move a large gold cargo, although the real reason is likely quite different. Losing access to the gold would be a huge blow to the country’s rapidly dwindling finances, and also to Maduro's rule who has been able to keep on the good side of the military thanks to generous bribes. It would also further crush the already struggling population as lack of hard currency will create even greater shortages of basic goods ranging from staple foods to drugs and toilet paper. The amount held by the BOE is equivalent to five times the total hard currency that Venezuela has sold in 2018 via hard currency auctions that are carried out under the country’s 15-year-old exchange control system, according figures compiled by local consultancy Sintesis Financiera. While the government has promised to auction 2 billion euros in foreign exchange over an unspecified time frame, it has yet to say where it plans to obtain those funds. Meanwhile, even if somehow Venezuela manages to repatriate the gold - which now looks unlikely - the new U.S. sanctions could make selling it to raise hard currency difficult. Meanwhile, Turkey has emerged as the biggest buyer of Venezuela gold: Caracas has been exporting gold to Turkey in the last year, a business that has grown as Maduro has built up ties with Turkish President Tayyip Erdogan. As such, selling the gold directly from the Bank of England to a foreign buyer would be logistically easier than shipping it, but could also risk running foul of sanctions especially now that Erdogan is trying to get back on Trump's good side. As noted above, Venezuela's late socialist leader Hugo Chavez, sending which way the wind is blowing and citing the need for Venezuela to have physical control of central bank assets, in 2011 repatriated around 160 tonnes of gold from banks in the United States and Europe to the central bank in Caracas. But some of Venezuela’s gold remained in the Bank of England. Starting in 2014, Venezuela used this gold for “swap” operations in which global banks lent Venezuela several billion dollars with the gold as collateral.